I made 'The Peace Tree' as a commission for 'EXHIBIT EQUALITY' and the auction held at [space on white] in NYC on Sept 20th. The collage element is made up of an old Banana Republic nylon coat I had lying around...What you're seeing are two images in one. On one hand we have the peace sign that I wanted as a beacon in the background, steering the message behind the whole work. While on the other I blend the icon into a sort of landscape. 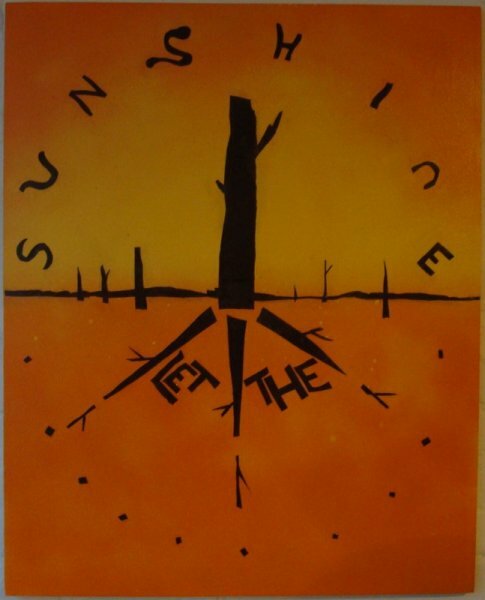 The idea is of a burning Southwestern sunset, a forest of dead trees in silhouette, and the promise that no matter what, the sun will always shine. I curbed the piece toward the current Broadway revival of HAIR, seeing as the event was in-part affiliated with the production, and borrowed the famous lyric "let the sunshine" to further drive my point home. love. Previous page: Trouble On Wall St.